Peaceful and Serene Lake/River Area Vacation Rental. A unique experience you're sure to enjoy. This fantastic property is located minutes away from the best vacation activities that Northwest Arkansas has to offer. Because of its unique layout, the property can be rented as one room or add one or two rooms for a large vacation get-away because all rooms are adjoining. There is one bedroom with a queen bed, full bath, and kitchenette (refrigerator, microwave, sink, coffee maker, and toaster). It includes a downstairs patio with comfortable lounge chairs. The patio is serene… decorated with hanging baskets and only steps away from a beautiful hardwood forest. . .the perfect place to relax and enjoy your morning cup of coffee or afternoon and evening refreshments. You can add a second room with twin beds or this can be made up as a King bed on lower level. Upstairs is a separate living room with a sleeper sofa. It is furnished with a refrigerator, microwave, and coffee maker. The large deck area includes a covered seating gazebo that provides an excellent place to relax while enjoying the panoramic views of Beaver Lake and the beautiful Ozark Mountains. Children are welcomed and pets are allowed (with a fee). No smoking inside any unit is allowed. I am a the broker owner of New Horizon Realty, Inc. We have an office in Eureka Springs and at the lake area in the same building with the Sunrise-Sunset Vacations Rental. The building was originally built as a 4 unit motel, but has been a gas station, grocery store, restaurant and real estate office at different times throughout the last 50 or 60 years. We have just retored that part of the building to be a rental. This location is ideal for those who want to stay near the Beaver Lake or the White River yet be close enough to enjoy the Victorian, story book town of Eureka Springs. Rent just one room for a comfortable space for 2; rent two rooms to sleep 4 or all three rooms for parties up to 6. The property next to our building is owned by a lovely couple who have a knack for gardening, they keep chickens (you'll hear them clucking when they lay an egg and the rooster crowing in the morning). Also they raise rabbits so you might see a stray bunny roaming around the grounds. A little unique character that you don't get in your standard motel room or cabin. And who knows you might just love the area so much you'll want to buy some real estate. We're handy, just upstairs! toilet, combination tub/shower, Sunshine Room on upper level. There are a total of 3 full bathrooms all exactly the same configuration with ceramic tile walls and floors. Bath soap provided along with 4 bath towels, 2 hand towels and 2 wash cloths in each. The bed linens are all provided. Can be used by guests only with special permission and use instructions. 4 bath towels, 2 hand towels and 3 washcloths are in each bathroom. The brown wash cloths are for washing your makeup off. Plkease don't use the white ones. Includes a sofa, (which is the 7 th guset sleeping area) wing back chair, TV and dining table for 4. Also there are TV trays provided for extra indoor dining . There is a toaster oven in the kitchenette. Salt and pepper, coffee, creamer, sugar. Basic plates, bowls, silverware, glasses, cups, pitcher, tray, blender. Grill utensils are inside the gas grill cover. The kitchen is small with a sink and a little counter space and does NOT include a cooktop or oven. The kitchenette includes a sink, full sized fridge, microwave, toaster oven and coffee pot. Flat screen televisions in each bedroom. 10 chanels plus HBO and Starz Movie chnanels. DVD player is downstairs in the living room. Bring your own movies if you like. Paperbacks are available for reading. There are a few card games for children AND SOME BOARD GAMES. There are a few movies in the living room area where there is a DVD player is built into the top, back of the TV. There is a small yard space on the lower level and a large grassy area next to the building that is great for playing with your children or pets. There are several local outfitters in the area with canoes, kayaks, stand up paddle boards for rent, as well as a marina close by with boat and jet ski rentals. Let me know how I can help! Spacious concrete patio area with grassy area on lower level. 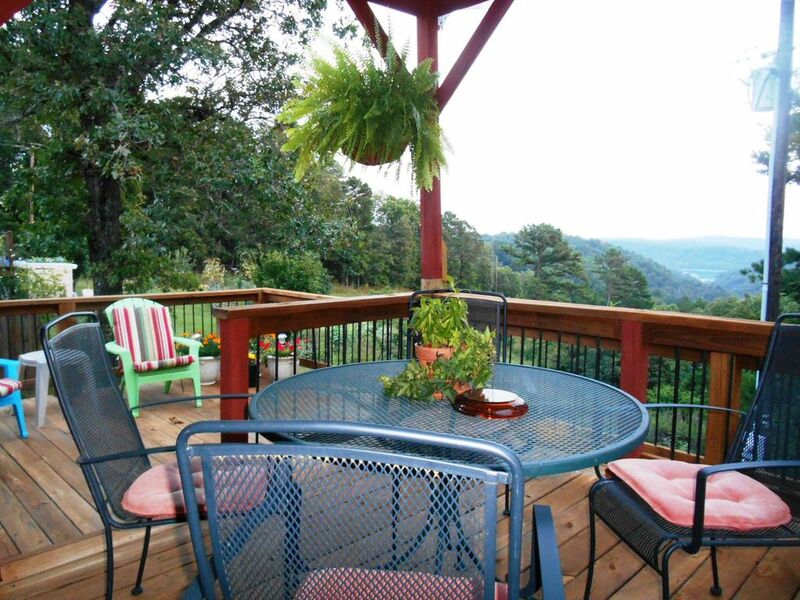 Deck with gazebo and great view on upper level. The Holiday Island Gold course is about a 20 minute drive away. Rogers/Bentonville is about a 45 minute drive and has several courses available. Quiet, peaceful area. We relaxed each evening on the patio, listened to the birds singing. Some of the negative reviews for this property were un warranted. Read the replies for the complaints before deciding if this property meets your needs. We had a very memorable and enjoyable stay. Evelyn responded to all texts and calls when the circumstances warrants. I would rent this again for sure. The only downfall is the lack of a stove, our party didn't need one as we planned to eat out every meal. Plenty of outstanding eateries within 20 minutes drive. The house was perfect for our stay, close to activities but still just far enough from town that it was peaceful and relaxing. Will definitely be staying here again! The property is very clean, neat, and well-appointed. Peaceful, quiet, and relaxing. Evelyn is very responsive and helpful to address any questions. Just a short drive to Downtown Eureka Springs and points of interest. I would highly recommend this property. Great place great view . Our view is nice, even in winter. It changes with the seasons, of course so come enjoy! When I first looked at the property on the pictures I thought it was a house with a kitchen. You had to go through one of the bedrooms to go upstairs to the other bedroom. one of the bedrooms was separated from the rest of the property, and had a separate entrance. Also had to lock two different doors to leave. Wasnt at all like I expected. It was connected to a real estate office with dogs next door that were jumping the fence. Sorry you didn’t read the description which clearly describes our property and it’s amenities. Also I sent directions and check in instructions that went unread as well. You can’t always rely on GPS when you’re in our area. All the bedrooms have their own entrance from the outside. Most folks like that feature. Located just 10 minutes west of the Victorian tourist town of Eureka Springs and 30 minutes east of Rogers/Bentonville, home of Walmart and the new Crystal Bridges Museum. Its only minutes to Beaver Lake and the White River where there are opportunities for all types of boating, water sports, fishing, swimming, camping, hiking and biking. Music festivals, car shows,craft shows, great shopping , good restaurants and other fun activities are available nearby. Starkey's Marina and Corp of Engineers parks are minutes away also. Rates are variable and determined according to a number of people staying, the number of rooms used, pets etc. Typically 1 room with Queen bed, full bath and kitchenette is $85.00. If you want to add the use of another bedroom and bath the fee is $50 per night. We have 3 bedrooms, 3 baths. All include the use of the living room, kitchenette (not a full kitchen with a cooktop or oven), the lower pato with gas grill and the upper deck with the gazebo and fabulous view.